Whoopee, we're on Page 3. 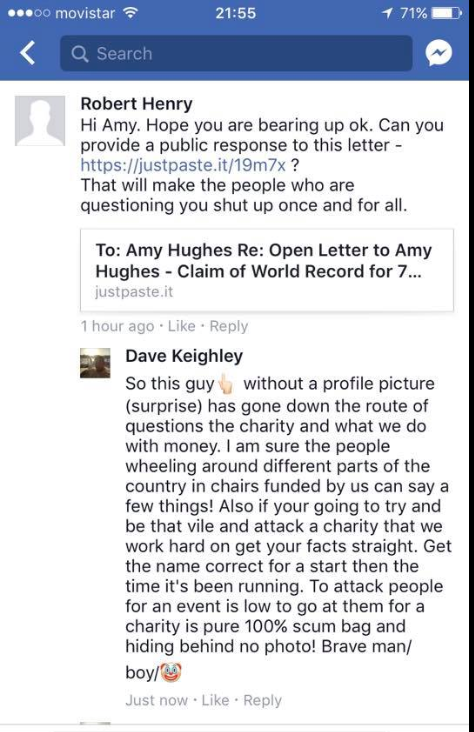 I think Dave Keighley just deleted that reply thinking that poster is me. I saved your screenshot of it though, thanks. Fake data is rather easy to produce. OK, could you fake me a 2:35 London Marathon Garmin track for the 2018 race with mile splits, cadence and heart rate data please? I can do that for you. It's a bit of work, but possible. How does $100 sound? Not going by doubler anymore, eh? RE: Women runs 520 miles on treadmill in 7 days but doesn't get WR as Guinness says her witness doesn't count 8/2/2017 3:31PM - in reply to Whoopee, we're on Page 3. Never thought I say it, but I'm actually feeling sorry for the ultra running community having to put up with all these scammers like this woman, the Reading's, Young, etc. Their sport is just becoming a total joke and farce, it's down there with gum boot throwing (yeah there is a WR for that), and that bloke who admins the Ultra Running Facebook site doesn't help either lol. Things will soon get a little more juicy ones the UK Charity Commission is involved with this probable charity scam. Maybe Dave needs a lawyer after all. I am blushing at being mistaken for the legendary Andy Tavin. I'm just a minor wannabe jealous hater/troll, not the official team Reading/Shingler troll. Has it even been reported to the charity commission? RE: Women runs 520 miles on treadmill in 7 days but doesn't get WR as Guinness says her witness doesn't count 8/2/2017 3:39PM - in reply to Oh dear, how sad, never mind. The sport of ultrarunning is fine. Scammers are just part of the game since Stan Cottrell and Frank Ginannino. 520 miles in a week = 74.28 miles a day. That's a helluva distance. I wonder if Amy is quicker than the legend that is Rob Young. Letsrun fave Rob once ran for 2 days on a treadmill for charity, which was properly recorded and managed 147 miles. Amy therefore not only bettered ultra legend Rob, she still managed an additional 5 days at that same pace. Even if she had "Strava" or GPS/Garmin data, this hater forum would just say she/they hacked it somehow. Do it right and we will applaud. In this case the lady with the legitimate record deserves proper treatment...as in not having her record superceded by an ignorant bimbo. RE: Women runs 520 miles on treadmill in 7 days but doesn't get WR as Guinness says her witness doesn't count 8/2/2017 3:41PM - in reply to Oh dear, how sad, never mind. For the third time, I'm not paying anything, you say you can do it, prove it. It's somewhat telling that this "World Famous" message board forum can't even raise a simple $100 (or less) to offset the labour and know-how costs involved in faking data that is irrelevant to the actual new world record (521 miles on a treadmill in 7 days) that Amy set for her charity (The 53 Foundation). No one has body shamed from what I've read. Most think she's very attractive. Probably they'd wonder what NASA did with all the moon landing data too, when it's been faked so many times, there's no point in reviewing it anymore. Ahhhh this is a classic. Watching Amy Hughes and Dave Keighley going down the tubes as alumni Robert Young, Mark Vaz and Dave Reading did before them. Little did they know. They don't know it yet but their names will be spoiled forever. And all just for a little treadmill run which nobody really took that serious until some did. Running out of popcorn soon have to get some more.